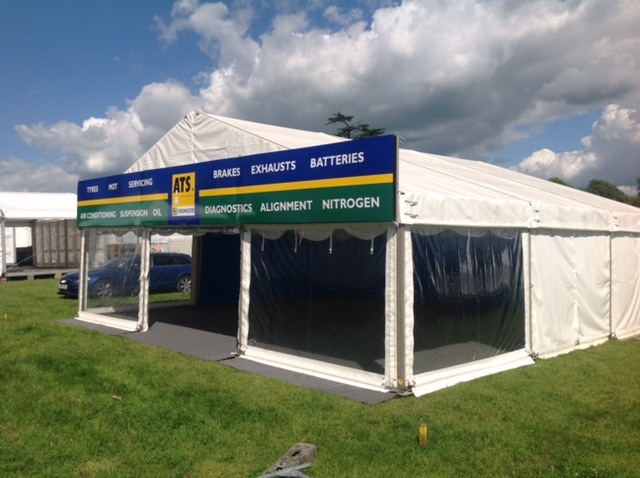 ABC Marquees are providing the Corporate Marquee for ATS Euromaster at Goodwood’s Festival Of Speed this week. What better place for a tyre supplier to promote their products than at the prestigious Festival Of Speed at Goodwood race course? Running from 25th – 28th June, “the largest motoring garden party in the world” celebrates all things motor sport – so it’s very apt for ATS Euromaster to attend the festival! We have provided marquee hire for two years running for ATS at Goodwood (last year’s marquee is pictured), working into the evening before the festival opened this year to ensure the marquee and flooring were securely in place ready for their vehicles and products to be displayed. This year’s 9m x 9m marquee – in a prime location – also features white marquee linings, carpeted internal walls and a large branded banner – all in ATS corporate colours, so they will be easy to spot! You’ll find the ATS team opposite the NGK stand, putting racing tyres on racing cars, doing tyre change demonstrations and promoting products such as Techron, as well as ‘tinkering’ with their own rally car … they are also giving away 20 Techron Fuel System Cleaning Services each day of the festival, so pop over to their stand to enter the prize draw!